This user group saw our greatest number of attendees since we launched the user group three years ago. It’s clear there’s a need for Eloqua users to enhance their awareness of the Campaign Canvas. The best advice I ever received about the Campaign Canvas was that it’s extremely logical. It will do exactly as you ask it to do. This means a careful review of the flow of your campaign is a good way to ensure you’re going to deliver a unique customer experience. 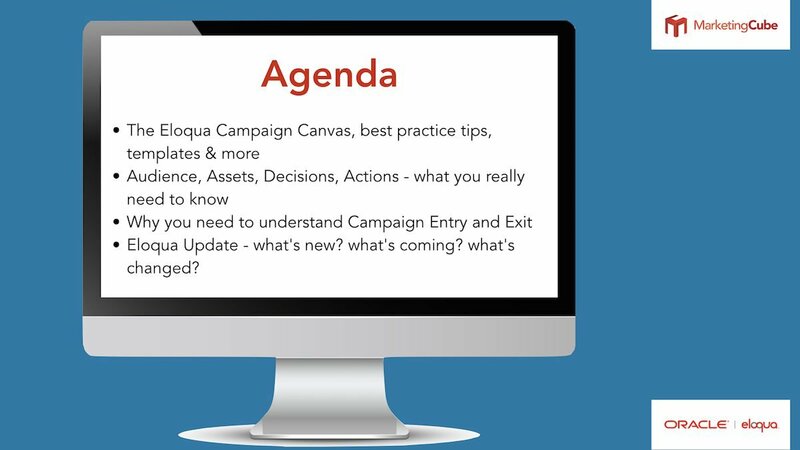 The Eloqua Campaign Canvas, best practice tips, templates & more. One of the most common mistakes made by new users to Eloqua is forgetting to use the WAIT Action element. The WAIT element pauses the flow of campaign members until a specific date and time or for a set period of time that you request. The wait element often follows the delivery of an email. You need to wait or pause for a period so your campaign members have a chance to receive your email and then act on the offer. It makes no sense to send an email and then immediately ask “did they open” the email. TIP: Remember you’re trying to engage humans, don’t get buried in the cool automation. Use the automation to help you learn more about the person you’re trying to engage with. “The campaign canvas includes a wide variety of elements that you can use to create rich, multi-step campaigns that meet your marketing goals. Each element has its own configuration needs: some elements, like Wait, are very straightforward, while others require a more complex configuration. When you fully configure an element, it changes color. You must fully configure all elements before you can activate a campaign. 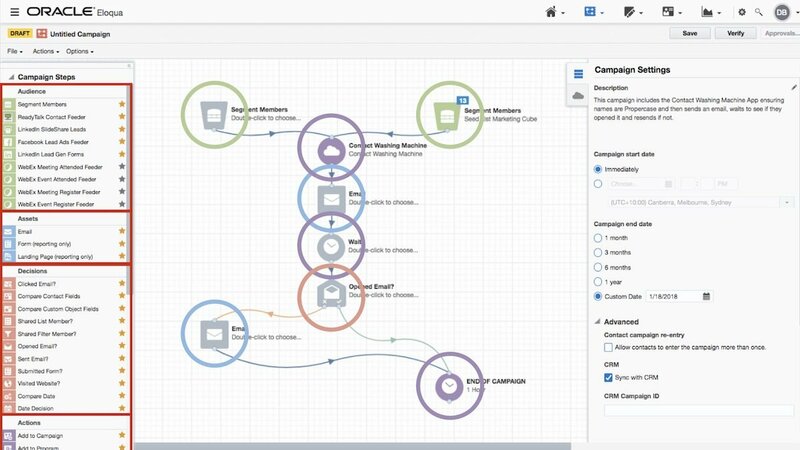 You can also extend the functionality of the campaign canvas by using Oracle Eloqua AppCloud apps. These apps enable you to integrate your campaign with other systems like WebEx, ReadyTalk or GoToWebinar. Remember, a Contact enters a Campaign Canvas and they will exit a Campaign Canvas at some point. Your contacts become campaign members once you add them to a segment and add the segment to a campaign canvas. Some marketing systems refer to this as being a member of a list. That thinking is very binary. A segment can be static or dynamic, meaning it can be a fixed number of contacts or, based on the segment filter criteria you apply, people can be added to a segment at set intervals e.g. once a day for the duration of your campaign. 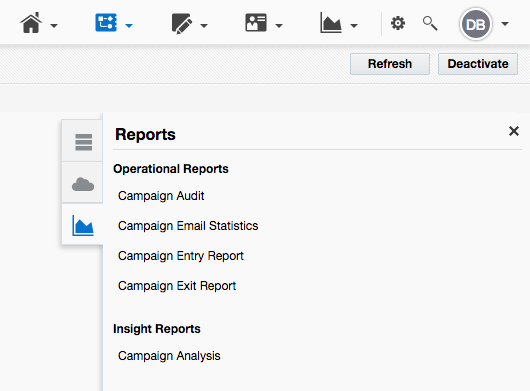 Once your campaign is Active, you can view a detailed report of each contact and their entry and exit in the campaign from the reports menu on the campaign canvas. This function is closely linked to your campaign start and end dates. All campaigns, regardless of being digital or ‘analogue’, will have a start and end date. Your Eloqua campaigns are no different. 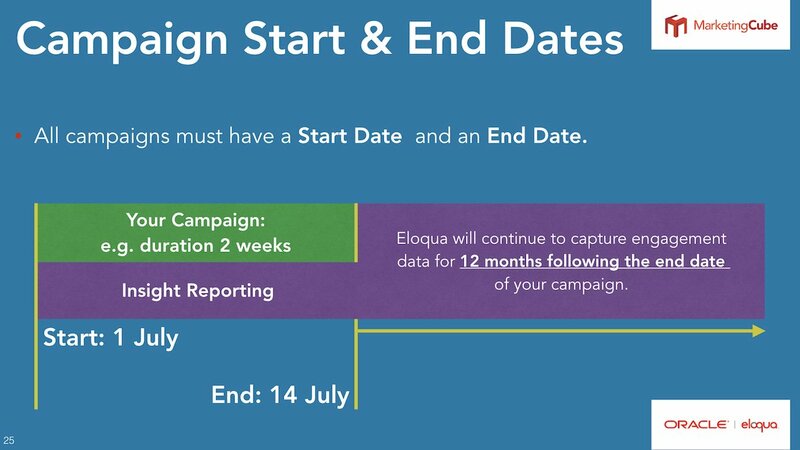 One common error made by new users to Eloqua is to extend the end date of their campaign under the misconception that reporting will cease on their campaign end date. This is not the case. Eloqua will continue to track digital body language for 12 months beyond the end date of the campaign. See the diagram above as an example. Now a regular part of the Eloqua User Group, our final topic will be platform updates to Eloqua and Eloqua Apps. 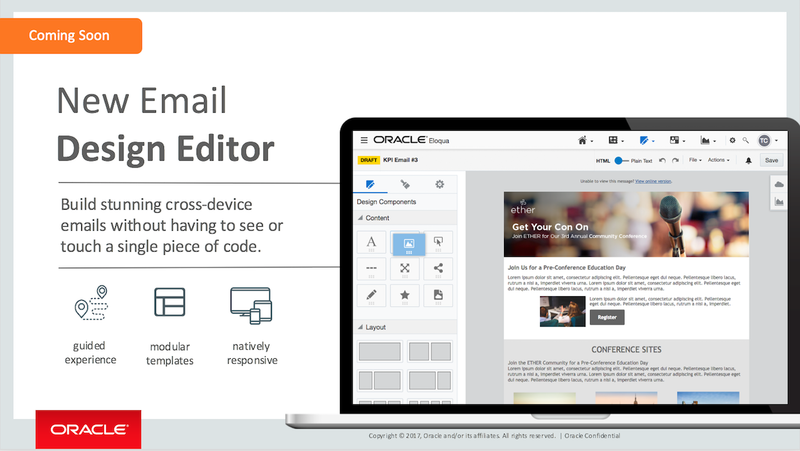 The new Email Design Editor is the big news this month. Various clients have obtained early access to the BETA release. We’ve been using the new editor for about five months. It’s simple to use and delivers responsive emails with no need for any HTML coding.